At long last, Imagining the Divine is installed and open to the public! While visitors are more than welcome to visit the exhibition on their own schedule and at their own pace, or take a guided tour of the entire show, some may wish to dive a bit deeper into the broader themes that emerge when these objects come into conversation with each other. To that end, we are very excited to announce a series of upcoming gallery talks run by the Talking Religion students. 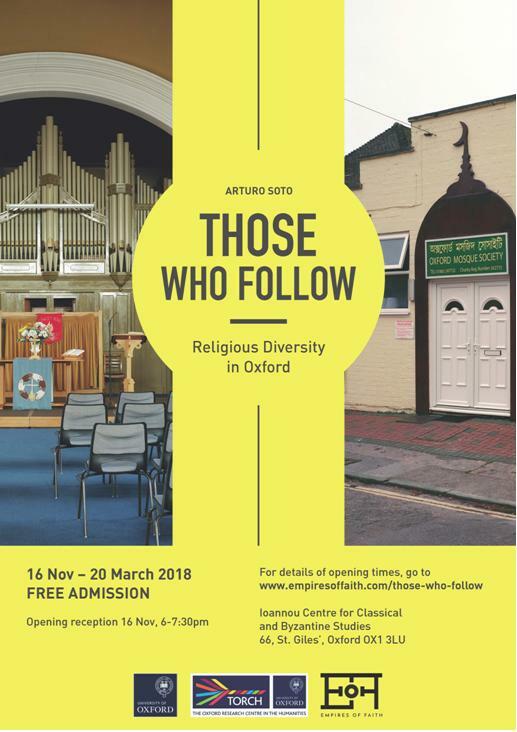 Each short, focused talk will be led by two Oxford doctoral students from the research group, exploring a particular theme across religious traditions featured in the exhibition. What can we learn by comparing Christian images to Buddhist ones? What does death have to do with pilgrimage? And what makes a space sacred? This is a great opportunity to have a closer look at some of the objects on view, ask questions, and get a taste of the cutting edge research behind the exhibition. Mark your calendars! A description and schedule of the talks follows. They are free with entry to the exhibition, no booking required. Further details can be found on the Ashmolean’s website and the Empires of Faith Facebook page. From a Christian pilgrim’s token, to the grave of a young Muslim girl, Helena and Fuchsia trace the important role that objects can play in journeys through life between these two religions. What do pages of the Quran, an ivory plaque from the court of Charlemagne, and a map tell us about God? Andy and Ilenia look at how God was manifested in word and image across diverse cultures. The image of Christ and of the Buddha combine artistic influences from more than one religion. Sylvia and Hugo trace the fascinating developments through two sculptures of these most important of religious figures. What do we think of as sacred space? From the image of Christ on a Roman floor, to a standing stone in the Welsh valleys, Penny and Kristýna look at how images and objects make space sacred. Incantation bowls and amulets of all shapes and sizes sit on the fringes of religion and magic. Hugh and Sajda draw together remarkable pieces from the Mediterranean to Afghanistan, to think about what they share.